This internationally acclaimed self redemption crane machine is an offshoot of the popular PLUSH BUS crane machine. 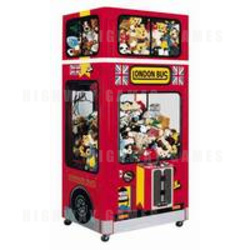 This crane machine includes a double-decker bus cabinet, with space in the top deck for vendors to display their best prizes. LONDON BUS can be seen in over 23 different countries around the globe adding an international flair to any location big or small. While it has been a great attraction in the UK and throughout Europe, the LONDON BUS has enjoyed equal success in the US and many other non-European venues.